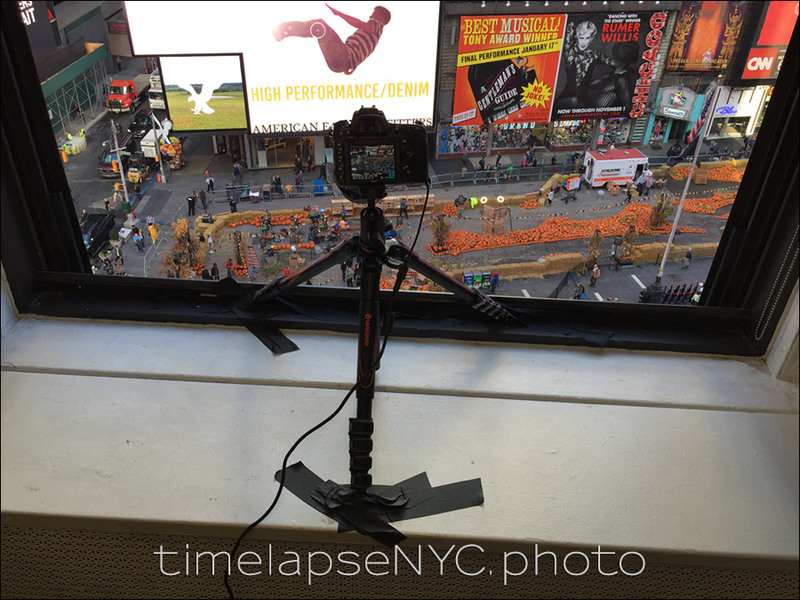 Every time-lapse project brings its own set of unique technical challenges that have to be met. It starts with the planning for the shoot based on the client’s brief, but there is also on-the-go problem solving as the time-lapse photo shoot shapes on the day. 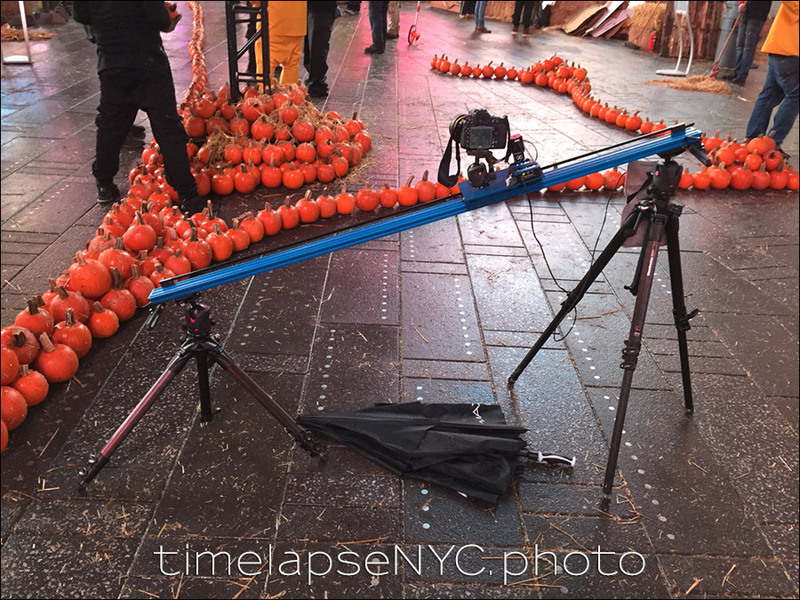 On October 29th, 2015, the Google Photos Pumpkin Patch was constructed in Times Square. The construction of the pumpkin patch took place during the night before, and there was a heavy rainstorm. 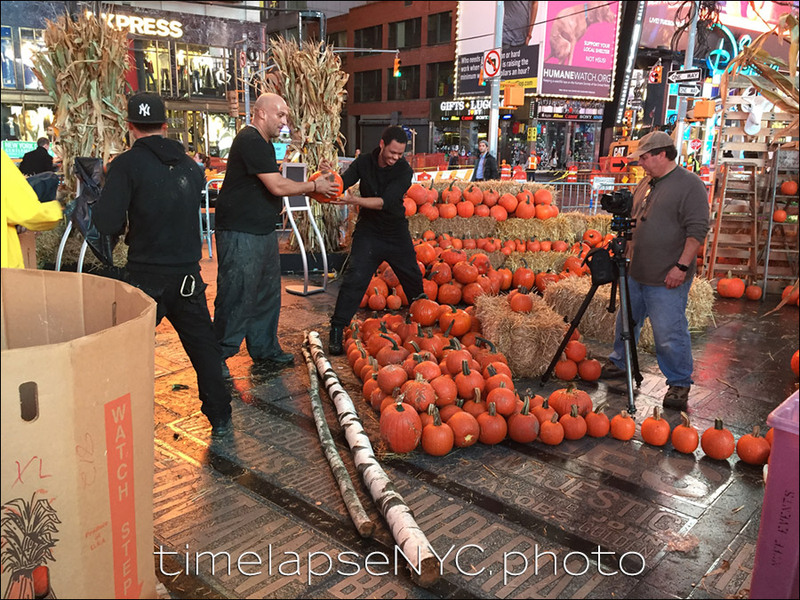 The time-lapse photography had to happen regardless of that, and we had to work around the weather and still keep up with the team of people building the pumpkin patch! 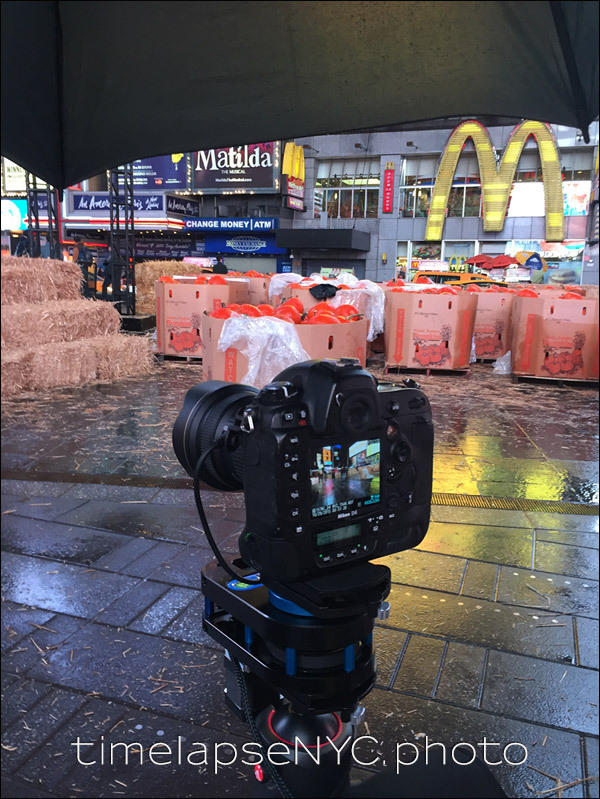 Of the total of 20 time-lapse sequences shot of the entire event as they built the pumpkin patch, two were finally used as the intro to Google Photos’ promotional video. The video above is a compilation of some of those time-lapse sequences, to show how it all unfolded. I used four cameras – one cameras was set up in one of the offices with a view of Times Square. The other three cameras were “roaming” cameras, and was moved depending on where the action was. I used a motion-controlled dolly to give a cinematic sweep to some of the sequences, as well as a rotational controller to give a wider view of the events. Some behind-the-scenes photos to show some of the setups are shown below. The final piece of the event was this Google Photos being built. 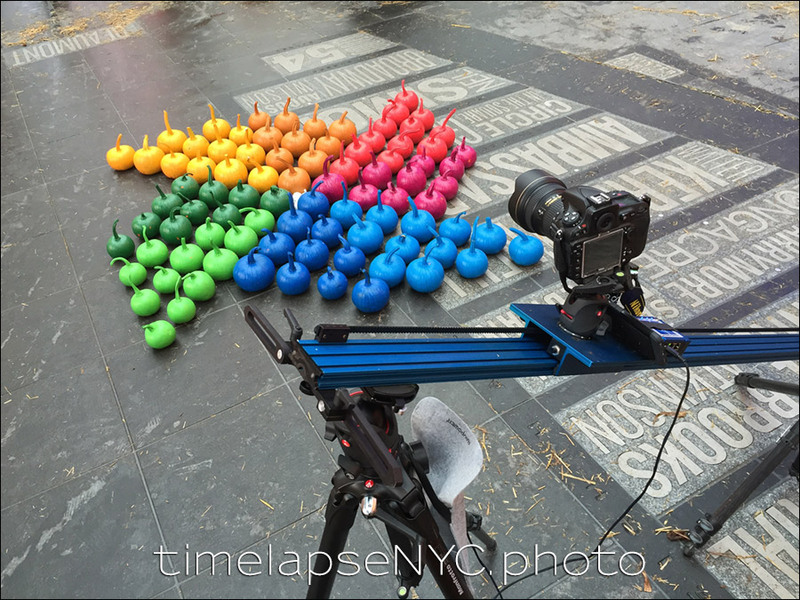 This photo shows the one camera on a motion-controlled dolly, which gives a cinematic movement to the time-lapse footage. One of the cameras that was set up on a rotational motion controller … under an umbrella to shield it from the rain. A motion controlled camera on a dolly that is set up so that it starts with a higher-up view of the row pf pumpkins being built, and then the camera progresses to a view from a low viewpoint, closer up. You can see the umbrella on the ground there – at this point the rain had dissipated. The camera set up from a window in the offices with a view of everything. This camera was on AC power to ensure that it could run non-stop without supervision. For that reason, I taped the tripod legs down so that it couldn’t be accidentally budged from its position. This camera recorded the continuous footage of the event, while the other three cameras were moved around to capture specific parts of the event. And here is one of the sequences of the final stage of the pumpkin patch being built – the Google Photos logo assembled from colored pumpkins.